Military weapons systems have become so specialized and high-tech over the years that it takes special training and often more than one person to operate them safely and effectively. The responsibilities of the anti-tank missileman, which is Marine Military Occupational Specialty 0352, involve the tactical employment of some very specific weapons. Military weapons that fall under the control and responsibility of the Marine anti-tank missileman include the TOW—a tube-launched, Optically-tracked, and wire-guided weapon system—as well as the Javelin weapons system. Both are widely used anti-tank missiles and they're capable of damaging and defeating tanks in battle, which is obviously crucial in combat situations. MOS 0352 is responsible for anti-armor operations and tactical vehicle operations. These servicemembers provide medium and heavy anti-armor fire in support of the infantry battalion, the light armored reconnaissance or LAR battalion, the tank battalion, and/or the Marine Air-Ground Task Force known as MAGTF. These Marines are located in the anti-armor platoon within the weapons company of the infantry battalions and LAR battalions, in the TOW platoons of the tanks battalions, and the TOW Company of the Tank Battalion. Non-commissioned officers are assigned as gunners and squad leaders. Marines must have a general technical or GT score of 100 or higher on the Armed Services Vocational Aptitude Battery, known as the ASVAB, to qualify for this position. The Marine Corps infantry provides two training schools for Marines who want to pursue a MOS 0352. Both are available after basic training. Anti-tank missilemen are required to complete the anti-tank assault guided missileman course at the School of Infantry at either Camp Pendleton in California or at Camp Geiger, a satellite facility of Camp Lejeune in Jacksonville, North Carolina. They might also complete appropriate managed on-the-job training. Recruits for this MOS must have a normal color vision, and vision of at least 20/200 that's correctable to 20/20. Their past driving records as reported by the National Driver Register must show that they are eligible for an SF-46 military driver's license, and they must possess the psychological and physiological qualifications required for licensing as a government motor vehicle operator. Infantry assaultmen provide rocket fire in support of Marine rifle squads, platoons, and companies within the infantry battalion. They're trained to use the anti-personnel obstacle breaching system or APOBS, as well as demolitions. This job is MOS 0351. Non-commissioned officers are assigned as gunners, team, squad, and section leaders. The LAV or lightly armored vehicle crewmen, which is MOS 0313, operates and maintains the LAV and its weapons systems. These vehicles are armored reconnaissance vehicles that can carry communications equipment. They're eight-wheeled and amphibious. The LAV's role within a larger Marine expeditionary unit or MEU is to conduct security, recon and screening missions for a larger force with some independent operations. 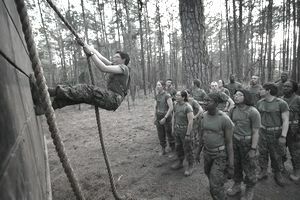 Despite the names of these positions—missilemen and crewmen—women are now permitted in U.S. military combat situations and any of these jobs can be held by female Marines.